To many, “modern design” suggests the simple lines, abstract decoration, and machine-based methods and materials that gained widespread popularity in the twentieth century. 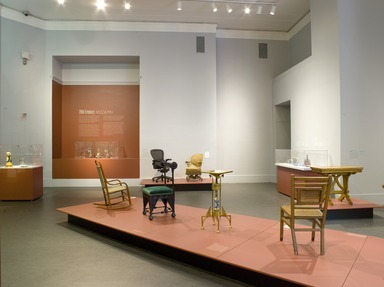 The objects in this installation, however, demonstrate that the development of modern industrial design and the emergence of a taste for abstraction began much earlier. The Industrial Revolution, which originated in England in the late eighteenth century and changed the course of Western history, led to fundamental changes in design. 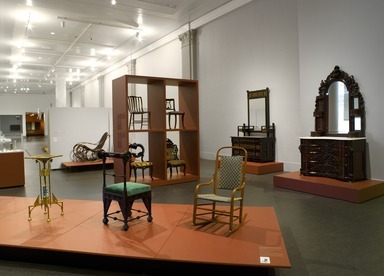 As more and more things were made by machine, the means of production began to influence the appearance of objects. Designers learned to work symbiotically with machines, making the most of what machines did best, and a new machine aesthetic developed that was characterized by simple decoration based on geometry or organic forms. Although this process can be detected as early as the beginning of the nineteenth century, it accelerated in the last quarter of the century as influential writers and proponents of design reform in the United States advocated a shift to simpler, pared-down designs. Many of the objects on view here were made during that time. Innovative approaches were sometimes hidden by traditional surface decoration, and objects that were more conservative continued to dominate the market. However, a taste for more abstract design slowly emerged, leading to the profound changes in international art, architecture, and design that took hold after 1900. In addition to changes in the appearance of objects, the nineteenth century saw the development of assembly-line production, cost-effective approaches to materials and techniques, and strategic marketing and advertising—all of which worked to shape the modern consumer economy we recognize today. 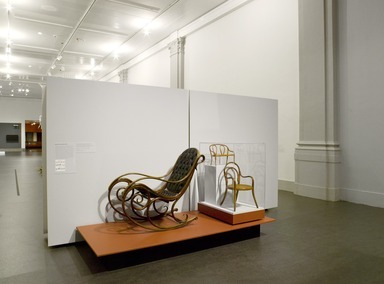 Many of the more modern-looking objects on display here were protected by a patent, a contract between government and industry to protect an invention from being used by others without permission. In the United States, an inventor has to submit an application showing that the design is new and useful, accompanied by a scaled drawing (examples of which are reproduced in this installation). The Founding Fathers thought that patents were so essential to the economic growth of the newly independent United States that the right to grant patents is included in the Constitution. The patent mark is usually prominently indicated on the object; it functions both to ward off patent infringement and as a marketing tool, signaling newness and innovation to the consumer. By the end of the nineteenth century nearly a million patents had been awarded in the United States, far more than in any other country, reinforcing the reputation of the United States as the land of invention and mechanization. 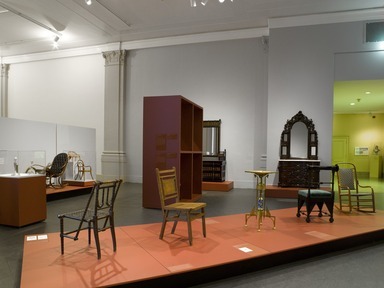 May 1, 2011 Featuring more than forty items from the Brooklyn Museum’s collection of American and European decorative arts, 19th-Century Modern will focus on the emergence of Modernism, an aesthetic based in part on the machine as a source of artistic inspiration. The installation will include objects from the early nineteenth century to the twentieth century to demonstrate the theme. Although this new machine aesthetic began in the early nineteenth century, it wasn’t until the last quarter of the century that the trend towards modernist design accelerated. In addition to differences in the appearance of objects, there were important modifications in how objects were produced and marketed. The works in the installation illustrate the development of the modern industrial world and the emergence of a taste for abstraction. Designers and consumers began to appreciate simple decoration based either on geometry or organic curves. Naturalistic depictions of nature continued to characterize conservative design and surface decoration, but a taste for more abstract design slowly emerged. 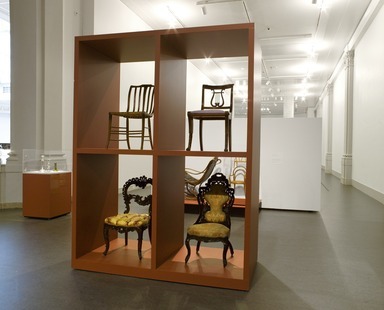 This can be seen in the furniture, architecture, and object designs of Frank Lloyd Wright in the United States, Charles Rennie Macintosh in Great Britain, and Josef Hoffmann in Austria, as well as in the Cubist paintings of Picasso and his circle in France. 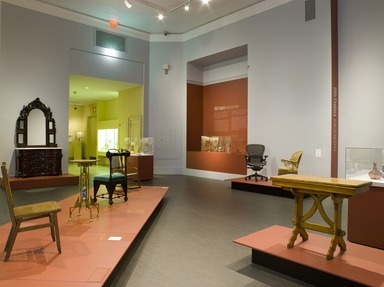 Among the items on view will be furniture by John Henry Belter, Duncan Phyfe, the Thonet Brothers, Samuel Gragg, Bradley & Hubbard, and George Hunzinger; silver objects by Tiffany & Company, Gorham Manufacturing, Elsa Tennhardt, and Napier; English earthenware; and a five-piece clock garniture manufactured in France by Guilmet. 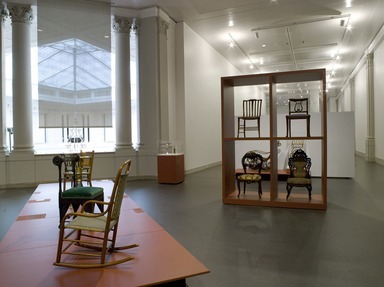 The installation 19th-Century Modern is organized by Barry H. Harwood, Curator, Decorative Arts, Brooklyn Museum.